Garden City, N.Y. – The Cradle of Aviation Museum is pleased to announce the opening of the JetBlue Sky Theater Planetarium, a new state-of-the-art digital projection system, an addition to the Leroy R. and Rose W. Grumman Dome Theater made possible in partnership with New York’s Hometown Airline, JetBlue Airways. This new addition to the Cradle will provide visitors with a fully immersive experience on Long Island’s largest screen, taking you to the limits of the universe and providing you with a unique view of our planet. Later in the year the Cradle will be launching a new component of the Planetarium called Uniview which will provide the museum with the capability to customize programs for different audiences. Univew is an astronomical package that creates real time and recorded programs of the Known Universe. It utilizes databases from NASA, the European Space Agency and a statistical database of more than 2 billion stars developed by the American Museum of Natural History. 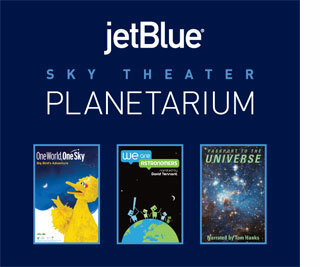 The Cradle of Aviation Museum would like to thank JetBlue Airways for their continuing support of the museum’s educational mission and the launch of the JetBlue Sky Theater Planetarium. JetBlue is New York’s Hometown Airline with other focus cities in Boston, Fort Lauderdale, Los Angeles, Orlando and San Juan. Known for its award-winning service and free TV as much for its low fares, JetBlue offers the most legroom in coach of any U.S. airline(based on average fleet wide seat pitch) as well as super-spacious Even More Space seats. JetBlue is also America’s first and only airline to offer its own Customer Bill of Rights, with meaningful and specific compensation for customer inconvenienced by service disruptions within JetBlue’s control. Visit www.jetblue.com/promise for details. JetBlue serves 71 cities with 700 daily flights. The airline plans to launch service to Providence, Rhode Island, as well as Cartagena, Columbia: Grand Cayman, Cayman Islands: and Samana, Dominican Republic this November, subject to receipt pf government approval, and Charleston, South Carolina in February, 2013. With JetBlue, all seats are assigned, all fares are one-way, and an overnight stay is never required. For information call +1 800-538-2583 (TTY/TDD +1 800-336-5530 from the USA, or visit www.jetblue.com. The Cradle of Aviation Museum is home to one of the largest collections of air and space craft in the world. It is located on Charles Lindbergh Blvd., in the Garden City/Uniondale area. For more information call 516-572-4111.